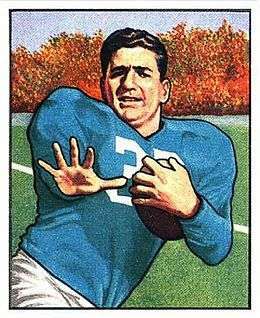 John Rocco Panelli (May 7, 1926 – March 2, 2012) was an American football player. He played college football for the University of Notre Dame. He went on to play two seasons in the NFL for the Detroit Lions, and another three for the Chicago Cardinals. Panelli died after a sudden illness on March 2, 2012. He was 85. ↑ "Former Lions player John Panelli dead at 85". ABC 7. Retrieved 2012-03-05. ↑ "Notre Dame backfield wizard John Panelli dies". The Globe and Mail. Retrieved 2012-03-05.